Outside Britain, it’s doubtful young people know the name of MG. It once was a famous sports car maker, but its heyday was more than 40 years ago. What was left of the company was bought by the Chinese, and the brand name is now used on sedans so boring the company doesn’t even take the pain to offer them in continental Europe. 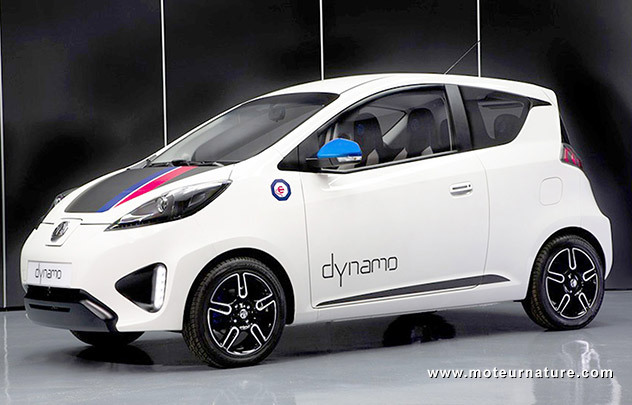 The brand is celebrating its 90th year in 2014, and it unveiled a concept for the party: the all electric Dynamo. This is 4-passenger city car, based on the production Roewe E50, another brand from SAIC (Shanghai Automotive Industry Corporation), which owns MG. It’s 3.57 m long (140 inches), and powered by a 50 kW motor. Range is a very limited 50 miles, meaning the car couldn’t compete with the Renault Zoé, or the Volkswagen e-up! which can make twice that, but that’s not the point. MG (and SAIC behind it) has no plan to turn it into a production model. The goal is to cheer up the brand, and old guys may remember that MG once made cars which were fun to drive and cheap to run, a bit like an electric car today. With the EV market still too small, it’s way too early, but in ten years from now, a Chinese-built electric MG sold all over Europe could make a lot of sense.